Item Type: USB Fan. -The Cooling Fan can be positioned to stand upright or laid flat to cool various electronics and components. 1 x USB Fan. 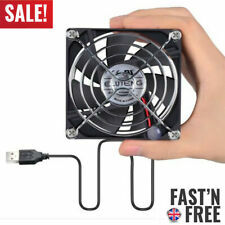 -Use for PC Computer, TV Box, Xbox PlayStation and other electronics and components need to cooling. Type: Cooling Fan. 1 x Cooling Fan. Used to cool PC computer case or CPU. Due to the light and screen setting difference, the item's color may be slightly different from the pictures. Motor Power: 1.05W. 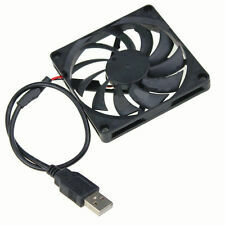 1pcs 5V USB 8015s fan. Connector: USB. Bearing Type: Sleeve. You may also like. It will cool your computer CPU very well. Interface Type: USB Port. 1 Cooling Fan. Fan speed is 800 ± 10%RPM. Fan Wire Length: Approx. 93 cm/ 36.6 in. If you do not receive our reply within 48 hours, pls. Power connector: USB 2.0. Use for computer case cooling fan. Fan speed: 2500±10% Rpm. Fan Size: 80x80x10mm. Unique fan blade to reduce turbulence and noise. 2PCSX 80 10mm fan. Bearing Stylev Sleeve. Material:Plastic,Wire Rod and Metal Color:Black Size:80x80x15mm/3.5x3.5x0.6in(LxWxH) Model:8015 Voltage:5V Electricity:0.3A Fan Speed:1300rpm Connector Type:USB Power Cable Length:About 58.5cm Weight:59g Feature: Easy installation. Feature: 1.Every product has a unique Manufacturing Part Number label on the inner package that proves it has been qualified,which include Part Number,Model Number and inspection date information; 2.If you have any questions about the item,please provide us the Manufacturing Part Number for checking,your profits will be guaranteed. 3.Plug & Play 4.Use for computer case cooling fan. 5.USB powered long life fan. 6.USB plug can power the fan through USB ports for electronics and game consoles. Specifications: Material:Plastic Color:Black Size:8 x 8 x 2.5cm/3.14x3.14x0.98inch(LxWxH) Cable length:42cm/16.53inch Weight: 72g Fan Speed:1300rpm±5%. Connector usb. It is best choice for your product cooling. 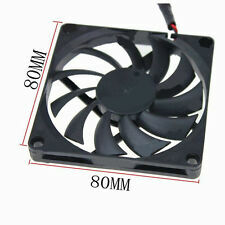 1 pcs 6cm fan. To Other Countries. Feature: 1.Every product has a unique Manufacturing Part Number label on the inner package that proves it has been qualified,which include Part Number,Model Number and inspection date information; 2.If you have any questions about the item,please provide us the Manufacturing Part Number for checking,your profits will be guaranteed. 3.Plug & Play 4.Use for computer case cooling fan. 5.USB powered long life fan. 6.USB plug can power the fan through USB ports for electronics and game consoles. Ending Soon. 80 mm, 1300 rpm, 10 dB, Black. 4 screws for mounting. - High-quality, stable, glass fibre-reinforced chassis in a classic design with anti-dust polycarbonate rotor. Suitable for Computer case. New Delta 80mm x 25mm 5V DC long life fan made in Thailand (model # AFB0805H-F00). Note that this fan is not PC-compatible! Fan Speed 3000 RPM at 5V. Country/Region of Manufacture Thailand. Type Cooling Fan. Qty: 10pcs. - Connector: 3pin/3wire. The order amount >GBP35.00 to Australia, United Kingdom, Russia;. Feature: 1.Every product has a unique Manufacturing Part Number label on the inner package that proves it has been qualified,which include Part Number,Model Number and inspection date information; 2.If you have any questions about the item,please provide us the Manufacturing Part Number for checking,your profits will be guaranteed. 3.Plug & Play 4.Use for computer case cooling fan. 5.USB powered long life fan. 6. 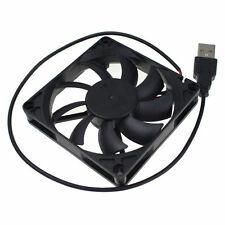 1 pcs 80mm usb fan. Connector USB. It is best choice for your product cooling. To Other Countries. Qty: 4pcs. - Connector: 3pin/3wire. 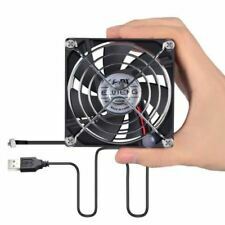 Sepcification: Material:Plastic,Wire Rod and Metal Color:Black Size:80x80x15mm/3.5x3.5x0.6in(LxWxH) Model:8015 Voltage:5V Electricity:0.3A Fan Speed:1300rpm Connector Type:USB Power Cable Length:About 58. Qty: 1pc. - Connector: 3pin/3wire. Model: NF-A8 5V PWM. Manufacturer's SKU NF-A8 5V PWM. Arctic F8 Silent (80mm) 3-Pin Case Fan with Standard Case. StarTech 80x25mm Dual Ball Bearing Computer Case Fan with TX3 Connector. StarTech 80x25mm Dual Ball Bearing Computer Case Fan with LP4 Connector. Qty: 4pcs. - Connector: 3pin/3wire. The order amount >GBP35.00 to Australia, United Kingdom, Russia;. Qty: 1pc. - Connector: 3pin/3wire. The order amount >GBP35.00 to Australia, United Kingdom, Russia;. Arctic F8 Silent (80mm) 3-Pin Case Fan with Standard Case. Model: NF-A8 5V. Manufacturer's SKU NF-A8 5V. StarTech 80x25mm Dual Ball Bearing Computer Case Fan with TX3 Connector. StarTech 80x25mm Dual Ball Bearing Computer Case Fan with LP4 Connector. The NF-A8 5V PWM is a PWM-enabled 5V variant of Noctua’s award-winning, premium-quality NF-A8 80mm fan. Noctua fans are renowned for their impeccable quality and outstanding longevity. By providing smoother torque impulses, SCD suppresses PWM switching noises and thus makes the fan quieter at low speeds. Qty: 10pcs. - Connector: 3pin/3wire. Features: 1.Plug & Play. 2.Use for computer case cooling fan. 3.USB powered long life fan. 4.USB plug can power the fan through USB ports for electronics and game consoles. Specifications: Material:Plastic Color:Black Size:8 x 8 x 2.5cm/3.14x3.14x0. Note: The color of the item may vary slightly due to photography and your own computer Material:Plastic,Wire Rod and Metal Color:Black Size:80x80x25mm/3.5x3.5x1in(LxWxH) Model:8025 Voltage:5V Fan Speed:1300rpm±5% Fan Noise(dB-a):25. 10000 hours service life, durable to use. Service Life: 10000 hours. Interface Type: USB Port. 1 Cooling Fan. Fan speed is 800 ± 10%RPM. Fan Wire Length: Approx. 93 cm/ 36.6 in. It will cool your computer CPU very well. Fan Size: 80x80x10mm. Use for computer case cooling fan. 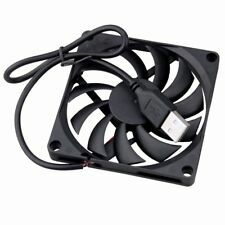 1pc X 80 10mm usb fan. Power connector: USB 2.0. Fan speed: 2500±10% Rpm. Unique fan blade to reduce turbulence and noise. Bearing Stylev Sleeve. Material:Plastic,Wire Rod and Metal Color:Black Size:80x80x15mm/3.5x3.5x0.6in(LxWxH) Model:8015 Voltage:5V Electricity:0.3A Fan Speed:1300rpm Connector Type:USB Power Cable Length:About 58. Use for computer case cooling fan. 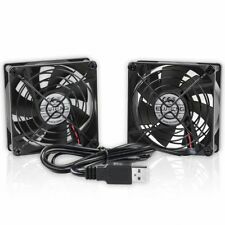 1 x USB Computer Case Cooling Fan. USB powered long life fan. Plug & Play. Fan Speed:1300rpm±5%. Connector Type:USB. Mode:8025 Type B.